Moji-Tea is a very refreshing drink. Here is a watermelon flavored Moji-Tea which is very easy to prepare and costs a fraction of the amount paid at restaurants. 1. Bring 2 cups of water to a boil. 2. Switch off flame and drop the tea bags and leave aside to cool. Once cool discard the tea bags. You can discard as early as you like to make it light. 3. In a saucepan add sugar and the 1/3 cup water to prepare a simple sugar syrup. 4. Bring to a boil and switch off flame. The sugar would have dissolved. Leave aside to cool. 5. Discard the seeds from the watermelon pieces and puree. Pass through a seive and keep the juice aside. 6. In a pitcher add the mint leaves and lemon juice. Using the back of a spoon muddle the mint leaves to infuse the flavor. 7. 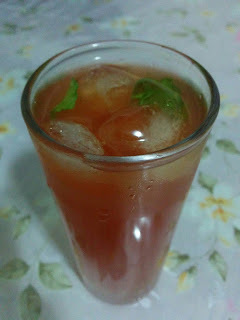 Add the watermelon juice, cooled breakfast tea and the cooled sugar syrup and mix to combine. 8. To serve, add ice cubes to the glass and pour the Moji-Tea. Serve chilled.